On Monday March 10th, hundreds of protesters assembled in front of the Philadelphia Federal Building demanding that President Obama not issue a permit for the Keystone XL pipeline, a proposed 1,700 mile pipeline that would transport oil from the tar sands of Northern Canada to oil refineries in Texas. 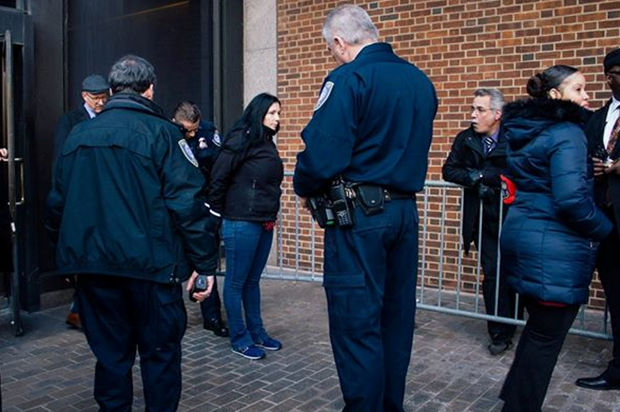 Dozens of people blocked the doors of the federal building, including 2012 Green Party Vice Presidential candidate and Poor People’s Economic Human Rights Campaign national coordinator Cheri Honkala, protesting the State Department’s conflict of interest in regard to the pipeline. The State Department contracted a consulting firm with ties to American oil interests to issue a report on the expected climate impacts of the pipeline—predictably reporting that the impacts would be negligible. 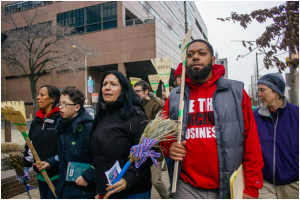 Wielding brooms to symbolically “sweep out corruption” from the State Department, the protestors called for an end to the climate crisis as well as the displacement and poisoning of poor and indigenous people caused by tar sands oil extraction. These crisis situations would only be worsened by the proposed pipeline, contrary to the State Department’s commissioned report. 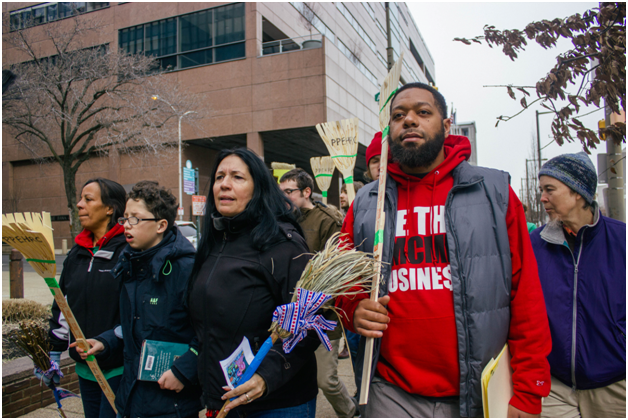 Members of the Poor People’s Economic Human Rights Campaign (PPEHRC), including national coordinator Cheri Honkala, joined the protest, making the connection between environmental and economic justice. “Poor people are the most affected by the climate crisis,” stated Honkala. “The Democrats and Republicans have thrown indigenous and poor people down the stairs again and again. This is no different. We should not be building new oil pipelines. The promises of jobs from oil companies are false. We can create long-term jobs by building a sustainable economy. The Green New Deal will provide jobs, housing, health care, and education for all, and it will address climate change and the environmental crisis.” PPEHRC stood with other protesters and delivered a message that the fight against environmental injustice cannot be separate from the fight for economic human rights. 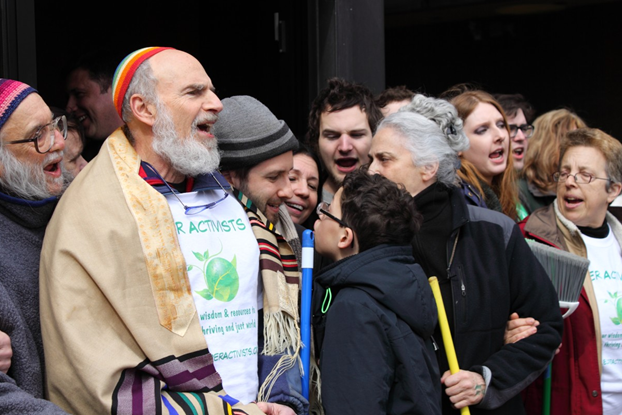 The Poor People’s Economic Human Rights Campaign will continue connecting environmental, economic, and other struggles for justice with the Earth Day to May Day Global Climate Convergence this spring. From April 22 to May 1, people and organizations will join together in coordinated action and collaboration across fronts of struggle and national borders to harness the transformative power we already possess as a thousand separate movements. As environmental, economic, and political crises intensify, the Convergence is a unifying call for a solution as big as the crisis. For more information, please visit http://globalclimateconvergence.org. Honkala was arrested that afternoon in an act of civil disobedience, along with roughly two dozen other protesters blocking the Federal Building’s doors. She was released later that night. Next Post: Help Us Grow the Fossil Fool MoneyBloom!